Unistrap is Universal's brand of high quality polypropylene strapping made in a choice of job-matched widths, thickness and tensiles. Unistrap has been proven to be an effective alternative to steel or nylon strapping at a fraction of the cost. 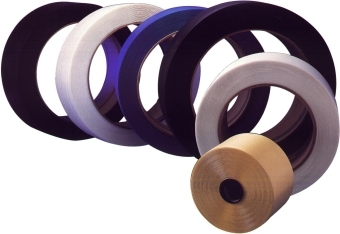 In addition to being economical, plastic strapping has the advantage in its ability to contain shrinking and setting loads, or grow with expanding loads. With your choice of closure method and application system, you get the kind of strapping efficiency that improves performance, saves job time and measurably cuts labor costs. Costs less--Saving up to 50% over polyester or steel strapping. Resists shock--Elongates 5% to 10% to withstand stress and absorb severe shock. Excellent recovery--Recovers 90% to 95% of it's original length. Impervious to rust--Can't be affected by rust or rot. Weighs less--Weighs only 1/10 of steel strapping for the same footage. Conforms to all shapes--Even with irregular-shaped cartons. Safer to use--No sharp edges, eliminates backlash. Notch resistant--Will not shear across strap even if nicked. Wide range of uses--Can be used by hand, with tools, or automatically. Self dispensing carton--Can be used from carton without a dispenser.